In his new tome, 'American Dreamer, the 65-year-old fashion mogul claims that the late music legend - who sadly passed away in January at the age of 69, following a secret battle with cancer - had a "dream" to get a group of musicians together to jam and record songs off the cuff in a "raw state". In the extract obtained by The New York Post's PageSix Column, he wrote: "His [Bowie's] dream was to gather incredible musicians and create music that they had never rehearsed, read or even seen before. "They'd simply go into a studio and play something for the first time and record it in that raw state. I found the idea thrilling." It comes following the news that a campaign aiming to raise £100,000 for a statue of the 'Starman' hitmaker has generated more than £25,000 so far. A Kickstarter campaign created by music club Friars Aylesbury is hoping to raise the huge sum to put towards a life-size figurine of the late musician to be placed in the market square in Aylesbury, Buckinghamshire, south east England. To mark the achievement of raising a quarter of the total, Holy Holy - a supergroup which performs Bowie songs - will play the late legend's fifth studio album, 'The Rise And Fall Of Ziggy Stardust And The Spiders From Mars' in full at Friars Aylesbury on April 3, 2017. The group features drummer Woody Woodmansey, formerly of Bowie's backing band The Spiders from Mars, and his long-time producer Tony Visconti, as well as Heaven 17's Glenn Gregory. 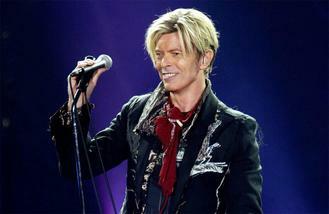 It will be the first time Woody has played the Ziggy album in the town since Bowie's show there on July 15, 1972. Friars Aylesbury had a special place in the late music legend's heart as he performed world debuts of two of his albums, 'Hunky Dory' and 'The Rise and Fall of Ziggy Stardust And The Spiders From Mars' at the club in 1971/72. While £25,000 of the £100,000 has been raised, the campaign is aiming to generate the full amount by December 6, 2016.